Hey everyone! 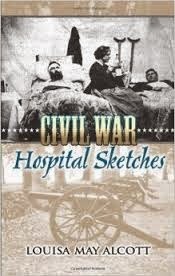 Today I have a review of Civil War Hospital Sketches by Louisa May Alcott. You may be familiar with her work; she’s most known for Little Women, Little Men, and Jo’s Boys. To give you an idea of how this fits chronologically into her work, she was a nurse in the Civil War for six weeks in 1862-63, got sick, went home and wrote Little Women, which was published in 1868. Civil War Hospital Sketches tells the story of Tribulation Periwinkle and her experiences being a Civil War nurse. While her experiences resemble that of Alcott’s, it’s important to remember they are not the same because it can get really confusing between the two. It is through Tribulation writing about her war experiences, a lot along the lines on how she would write letters back to her family. There`s also a postscript at the end, which neatly sums up her narrative. In many ways, this book is exactly what it sounds like: short chapters about life in the Civil War. She writes about getting a train ticket, her travel to the front, and her experiences there. Not to give too much away, I found the ways in which her war experiences changed her particularly interesting. Nursing was a very different profession from how it is now, and these women and men went into this with essentially no training. Another interesting idea this book slightly deals with is early feminism. Alcott begins with Tribulation saying, “I want something to do.” After being offered what was considered proper for a single woman to do (Write, teach, marry), her brother mentions nursing soldiers. Rather than being spurred by patriotism or a desire to keep the Union together, she is instead looking for some sort of life experience. This contrasts nicely with a character we meet later, who has joined the war effort because he believes in what he is fighting for. This book flounders a little at the end. We have this pivotal moment then it just tapers off. The entire falling action is packed into one chapter. The first half is very heavy in war experience with the second half being very lack luster. I’d definitely recommend this for fans of Alcott, especially if you want to explore beyond Little Women, Little Men, etc. Her writing style is still prevalent. I would also recommend this for people who are interested in war experiences in particular women’s war experiences. This was the main draw for me. For the class it was a good text to begin the class with, as it gave us some information on the American Civil War, which is the focus of the class. Have you read this book? What did you think? Let me know in the comments.